I’ve had several neat bird encounters that reminded me how much pleasure I get from our local birds. The first was shortly after we got back from our trip last Thursday. I probably should have put the hummingbird feeder out before we left, but I didn’t get around to it. While we were gone, several people on our birder email list reported male Ruby-Throats in the neighborhood. I like to have food for them as soon as they arrive, as I believe they are more likely to nest if they quickly find food. I got the feeder up shortly after we got home, and the next morning I happened to be outside near the feeder when I heard the tell-tale buzzing, and saw my first hummer of the year in the trees by the feeder. I’m sure I get a dumb grin on my face every time the first hummer of the season shows up, and this year was no exception. Ditto for the first tree swallows. I do my best to keep their nesting boxes clean and disinfected to keep the feather mites in check for them. I get the biggest kick out of seeing them zooming around and making their liquid calls. I happened to be in the greenhouse (no cover yet) rototilling when a tree swallow flew directly over me and did a few aerobatics just above my head before it continued along on its journey. I felt honored and humbled. I’ve also tried on numerous occasions to try to observe them flying with their mouths open. I’ve heard they get their name from this behavior, but I’ve never seen it, unfortunately. The other day I stepped out of the house onto the patio thinking about one thing or another, when a Red-Winged Blackbird came zooming around the corner of the house. He’d obviously made that trip numerous times, because we were goth pretty startled when he almost hit me. He zigged, I zagged, and neither of us were the worse for the wear, although I suspect both out heart rates went up. Finally, tonight I was outside working on a project, when I saw what looked like a seagull flying over the pond. It surely didn’t fly like a seagull, however, and as it grabbed my attention, I say it was seagull sized, with plenty of white on it, and it was causing quite a stir among the blackbirds in the vicinity. Although I only saw it for a few seconds, my best guess is it was an Osprey. What a tremendous few seconds it was. There is something special about the seasons in the north where we live. Many of our birds leave for warmer climes, and I can’t say I blame them. Their winter absence makes it that much neater to see them as the ground warms up and the critters start to stir themselves for another summer season. Last year, wine making season started with the strawberry harvest. This year spring has been so slow in coming that I’ve been looking for something to harvest to put me in the mood for summer. Even the dandelions are behind this year, but they’ve started growing pretty well in spots. 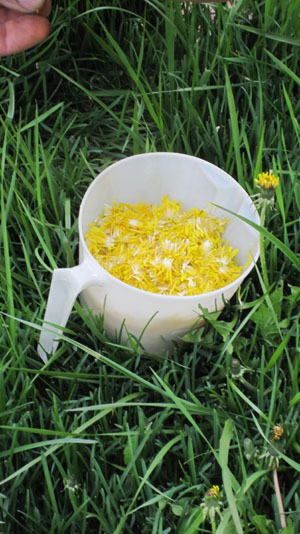 So I checked the recipe for dandelion wine, and learned I need 7 cups of petals. That didn’t sound too difficult to me, until I read the fine print, “Use only the petals. Discard green parts, as they impart bitterness to the wine.” Armed with my typical foolish optimism, I grabbed a measuring cup and walked out to the lawn after supper. I spent about an hour getting half of the petals I’ll need for one gallon of wine. As the evening cooled off, the flowers started to close, and that seemed like a good clue for the time to stop for the night. I learned several things during my harvest. First, choose big blossoms. The number of flowers in the big ones is high, and getting the flowers out of the center without disturbing the green on the periphery is key to success. Second, once the flower is picked, roll the base of the blossom pretty hard back and forth between thumb and forefinger. This loosens the individual flowers making them easier to pluck out. Third, get one of those ball slingshots for your dog, so you can shoot his ball far enough that he has to chase it for a while before he comes back to ask you to throw it again. Hopefully tomorrow I’ll be able to get the rest of the blossoms, and start the primary fermentor. It needs to sit for 24 hours before I can add the yeast. 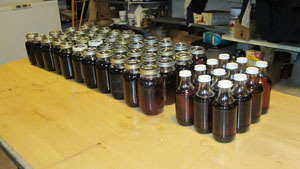 I am guessing that this wine will be a very pretty yellow color when it is done, just like the tips of my fingers. Last summer Alice and I visited Steve and John twice in West Virginia with our motorhome. Both times we stayed at the Stuart Recreation Area, which is part of the Monongahela National Forest. The campsites there are separated from each other by large wooded areas. It is quiet and private there. This summer in preparation for our mid-May trip to visit, we called the folks at the Stuart to make our reservation. It seem that last fall Hurricane Sandy did some serious damage, such that they wouldn’t be ready to open until Memorial weekend. I even offered to bring my chainsaw along and cut my way in, but the lady on the phone said that wasn’t possible. So I asked her about alternative places to stay, and she suggest Revelle’s in Bowden. I called and they did have an opening for the time period we wanted, so we made the reservation, plugged their address into the GPS, and proceeded on our adventure. The first thing that struck us about Revelle’s was the un-RV-like road that lead to the campground. It was a twisty narrow piece of blacktop that had large drop-offs where the shoulders were supposed to be. Our RV is big and wide, and when we’re towing the car, we can’t back up. Fortunately no one met us coming up the road, and we found Revelle’s without much difficulty. The person at the check-in was very nice, took our money, and drew us a map to our site. The layout at Revelle’s was very different from the Stuart. It was essentially a large field next to the Cheat River, with camper sites every 25 feet or so. We found our spot, and the guy across from us volunteered to help us back in. Once I was most of the way back, two ladies from the site next to ours came out to tell us we were supposed to move over a bit. Some picnic tables had been moved where we were supposed to park by the man mowing the grass, and he hadn’t moved them back. So the two elderly ladies started moving them for me. I jumped out of the RV and worked with them to get the tables out of the way, and then backed in without further difficulty. Once we were backed in where we belonged, we hooked Franco up to his leash, and took him for a short walk. Immediately the people across the way ran over and asked to pet our dog. We said sure. Among them were two teen-aged girls that were very friendly and polite, and who asked lots of questions about Franco and said what a nice dog he was. Well, there is no quicker way to friendship between people than dog praise, in my experience. During our stay, we walked Franco numerous times, and struck up conversations with lots of people. Everyone was very friendly, asking where we were from, how many fish we’d caught, etc etc. After a bit, I came to realize that although the two RV parks we’d stayed at in West Virginia were laid out very differently, we found the crowded open layout at Revelle’s nicer than we thought we would. Staying in a place like that seemed to instantly put us in the RV in-group. Every person there know what it’s like to move some fairly big and heavy equipment along the road, and that seemed to entitled us to instant camaraderie. We stayed there for 6 nights, which is a record long stay for us. I have to admit I was sorry to see the place go, and would not mind staying there again sometime. RV people are nice! 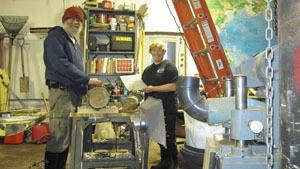 Last summer, we had our motorhome at Hilltop RV in Escanaba for several weeks to have some work done. When they called us to say it was ready, we drove the car down, paid the bill, hooked the car up to the motorhome, and took a short trip to Lansing. On a stop for food somewhere along US2, a fellow RVer waved at me in the parking lot, and said the lights on the car were blinking on and off. I filed that information away and continued on the trip. Later that fall, we took another trip with the motorhome to West Virginia, and planned to tow the car. The story of why we didn’t take the car is talked about in detail HERE. Shortly thereafter, we worked through the process of hooking up the car. Everything went well until the time to check the lights on the car. Just like last fall, there were no break lights, turn signal lights, no nothing. Shoot. I got the meter out and started working my way through the circuits. Through some faulty reasoning, I became convinced that something had happened in the wiring of the car that had caused the lights to fail. Unfortunately, the kit to make the car lights work properly was expensive, and the wiring required to make it all work was beyond my capability. Then I had another idea. When we bought the RV, we had set the pickup truck up to be a master source for the car lights too. So I hooked the pickup up to the car via the RV cable to test the theory that the problem was in the car. The results astounded me… everything worked! I wiggled things trying to get something to fail, but the car lights mimicked the truck lights perfectly. So the problem was not in the car. Now what? I decided to call the folks at Hilltop RV in Ishpeming and throw myself at the mercy of the service department. A very nice man answered, and I poured out my problem to him on the phone. He listened courteously, asked good questions a couple of times, and then suggested I had a grounding issue. I had thought the ground for the lights was transmitted through the metal in the towing apparatus, but he said no, that the lighting system for the car was transmitted through one of the pins on the 6-way connectors between the two vehicles. This scrap of information gave me a fresh perspective on the problem. I looked at the way the truck connector was wired, and compared that to the wiring on the connector on the motorhome. You guessed it… there was one misplaced wire. I removed the connector from the motorhome, changed the one wire, hooked everything up, and voila, it all worked! We shifted into high gear, loaded up the vehicles, and got on the road by mid afternoon. I’ve been outside a lot the past few days, and have encountered one of the consequences… ticks. I’ve found several on me and have gotten rid of them in the usual way. I’m a live and let live sort of fellow in general, and do not blame bees and wasps for stinging when they feel threatened. (See http://tedsoldan.com/?p=976 for an example.) Critters like ticks, mosquitoes, and blackflies, that seek me out for my warm blood don’t merit such treatment. My typical method is to first find the tick on me, squeeze between thumb and forefinger to keep it in one place, and then seek out a piece of scratch paper. I drop the tick into the center of the paper, wad it up around the doomed creature, and then stick it in the woodstove firebox. There is still work to be done. The evaporator needs to be cleaned as do all the buckets, taps, covers, and storage barrel. I plan to let things dry up a bit before I drive the Scout out there with enough water to do the washing up. Then there is the firewood to me made for next year’s season. I started this season with what I thought was a lot of firewood, and as you can see, it pretty much dissolved over the course of the season. 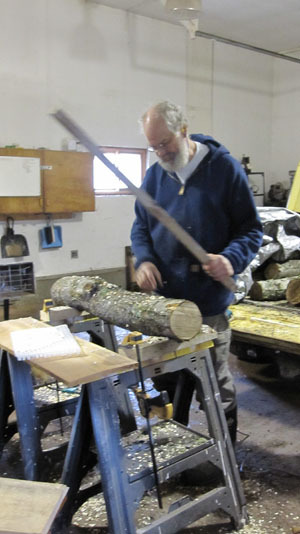 I have lots of balsam fir poles from the fir gathering last winter, and will be generating slabs from the sawmill throughout the summer, so we should be in good shape. I’ve long been interested in cultivating mushrooms, but never got the energy together to get the project started. One of Alice’s colleagues at work showed us her Shiitake mushroom rack with the logs so neatly stacked, and very kindly gave us a few of the mushrooms, and that got me over the hump. I called the folks at Field and Forest and placed an order for enough spawn for 12 logs. I learned from them that sugar maple was a suitable host for the mushrooms. So one Sunday I headed out, felled a tree that needed thinning, cut the logs to length, and piled them in the Scout. When the thimble spawn from Field and Forest came, I backed the Scout into the garage, fired up the heater, and began the process of drilling the necessary 11mm holes. The plans called for one hole every 7 inches along the log, and a new row every inch or two, with the holes offset to make a diamond pattern. I made a measuring stick to help with this part of the project. I found that the logs did not stay put on the sawhorses, so made a pair of blocks with wedges cut out of them for the logs to sit in, and that worked just fine. Once I had the process down, Alice joined me. 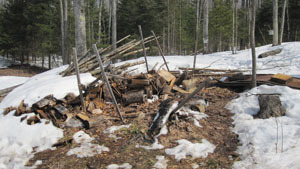 The inoculation went much faster with two of us working on it, and before long, all the logs were finished and stacked back into the bed of the Scout. 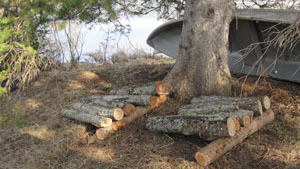 The instructions called for the logs to be placed somewhere in the shade to keep them from drying out, and near water, as they would need frequent baths in order to keep moist enough to bear fruit in the next year. So I wound up stacking them under the big spruce tree near the back pond. There was ample shade there and good access to water. I learned they could be watered by soaking them for up to 24 hours, and plan to tie the logs together and dunk them in the pond when the time comes. All-in-all, the project went pretty smoothly and I’m eager to see the results. We should get our first crop in about a year, with potential crops for the next several years after that. Last fall, I cleared some land for an expanded garden space. Among the trees I dozed were several good sized wild apple trees. 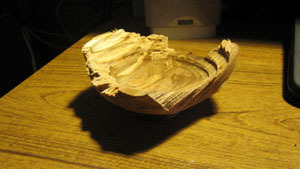 Apple has very interesting grains, and I had dreams of making some bowls from the salvaged apple wood. I watched some youtube videos like THIS ONE. It looked deceptively easy. So I purchased some enhancements for my small wood lathe. I got a chuck, a new tail stock, some bowl turning chisels, and some sharpening jigs for the chisels. As I’ve so often learned in the past, it is much easier to buy the equipment than it is to use it. After a very busy spring with maple syrup and Shiitake mushrooms, I finally had a small break in the projects today. I took the chainsaw out to the cleared land, and cut several pieces of apple wood, which I piled in the wheelbarrow and took to the shop. I chose one of the pieces of apple wood, split it in half, and mounted it on the lathe. The first part of the turning went pretty well. The shape of the outer part of the bowl went well for a first attempt. Then I spun it around and started removing the inside of the bowl. That didn’t go so well. I had trouble controlling the gouge. Several times, chunks of the bowl came loose when I became to aggressive with the tool. After a particularly wild cut, I turned the lathe off and went inside. My first bowl looks like something I made with a splitting sledge. But if I know myself, I learned more on this bowl than I will from any other bowl I’ll ever make. I hope to show a picture of a more successful bowl sometime soon. 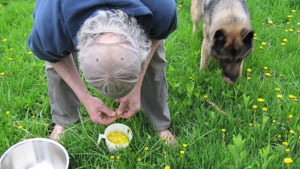 You are currently browsing the Rural Life in the UP of Michigan blog archives for May, 2013.